The Clorox Company (CLX) engages in the production, marketing, and sales of consumer products in the United States and internationally. The company operates through four segments: Cleaning, Lifestyle, Household, and International. The company is a dividend aristocrat which has increased distributions for 33 years in a row. The most recent dividend increase was in January, when the Board of Directors approved a 6.40% increase to 25 cents/share. The major competitors of Clorox include Procter & Gamble (PG), Colgate-Palmolive (CL) and Church & Dwight (CHD). Over the past decade this dividend stock has delivered an annualized total return of 8.60% to its loyal shareholders. The company has managed to deliver an impressive increase in EPS of 13.50% per year since 2001. 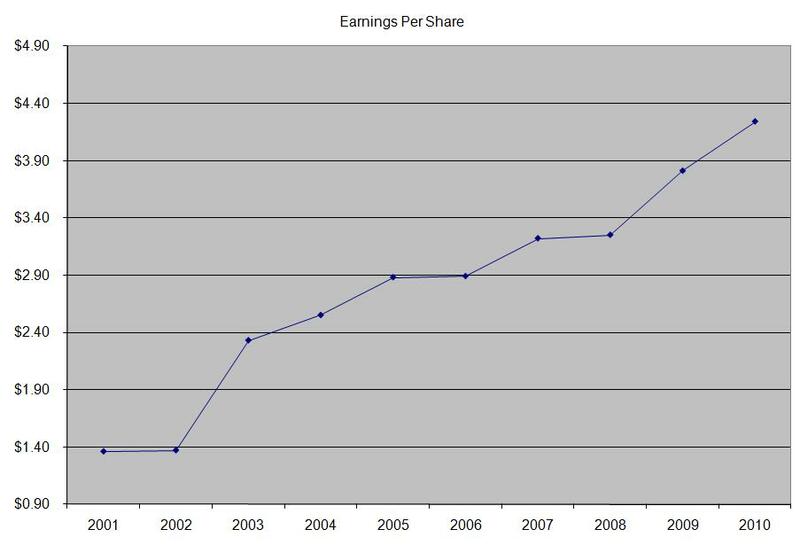 Analysts expect Clorox to earn $3.95 per share in 2011 and $4.43 per share in 2012. This would be a nice increase from the $4.24/share the company earned in 2010. The company has managed to decrease the number of shares outstanding by 6.70% per year over the past decade through share buybacks, which has aided earnings per share growth. Basically the company will try to deliver further growth through an ongoing focus on consumer megatrends. In addition to that the company will be targeting a 2% sales growth through product innovation. The company projects sales growth of 3-5 percent, excluding acquisitions and expansion into new geographies through 2013. Last but not least Clorox will target margin expansion and maximizing cash flow through implementation a continued robust cost-saving program and maintaining price increases the company has taken. 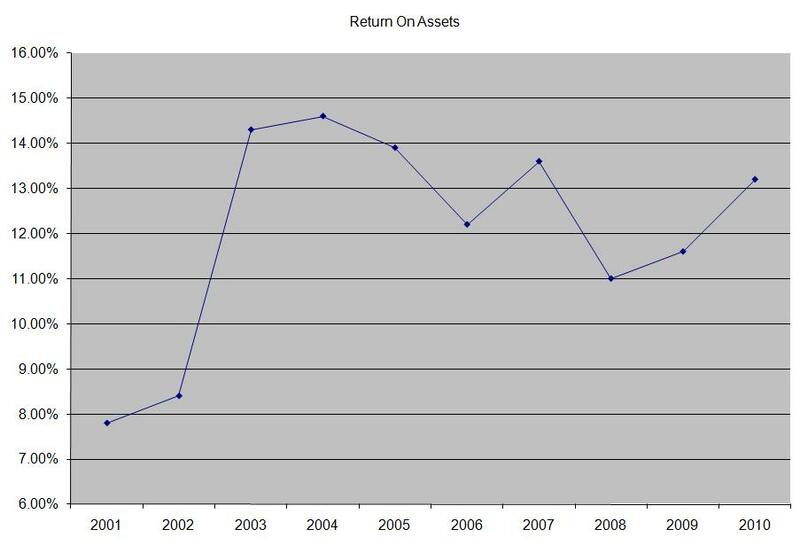 The return on assets has largely remained above 11% since 2003. 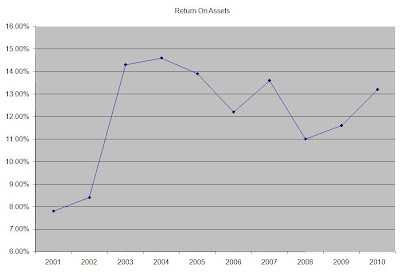 I used return on assets, since the stockholders equity portion of the balance sheet was negative after in 2004 Clorox exchanged its ownership in a subsidiary for approximately 29% of the company’s outstanding shares at the time of this transaction. 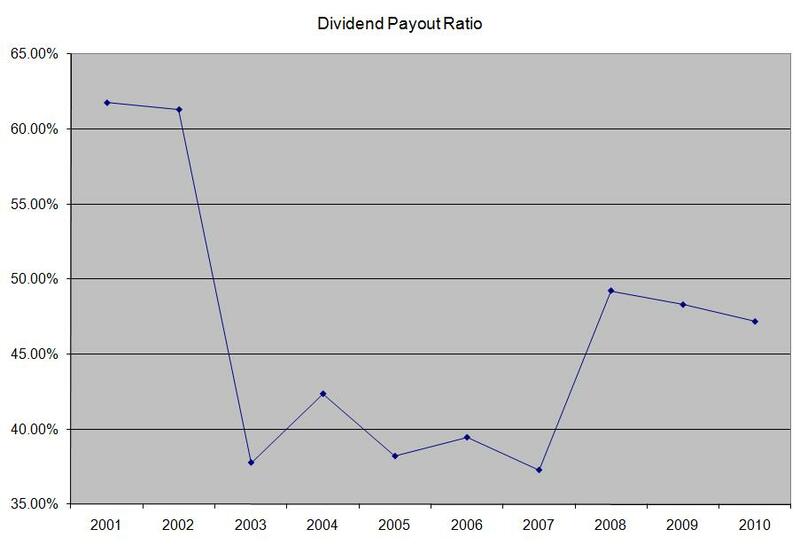 The annual dividend payment has increased by 10.10% per year since 2001, which is lower than the growth in EPS. A 10% growth in distributions translates into the dividend payment doubling every 7 years. If we look at historical data, going as far back as 1983, we see that Clorox has indeed managed to double its dividend every seven years on average. Over the past decade the dividend payout ratio has remained below 50% for a majority of the time with the exception of a brief period in 2001 and 2002. A lower payout is always a plus, since it leaves room for consistent dividend growth minimizing the impact of short-term fluctuations in earnings. Currently Clorox is trading at 16.80 times earnings, yields 3.20% and has a sustainable dividend payout. The stock meets my entry criteria, and I will look forward to adding to my existing position in it.